Tonight we had simple but extraordinarily delicious dinner: Dijon chicken with new red potatoes (from our garden!). I went back through the steps that created the flavor for the meal. Between using a concentrated broth made from chicken bones & vegetable peelings, caramelizing onions, cooking the chicken legs in a cast-iron skilled on high heat to get a Maillard reaction, using strong French mustard, and then reducing the cooking liquid to a thick sauce, I created a dish with out-of-this-world flavor. 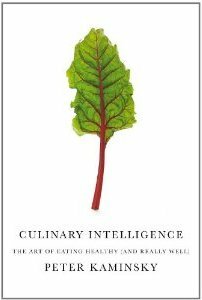 Peter Kaminsky, author of Culinary Intelligence, would note that I had created maximum flavor per calorie (FPC). Kaminsky, a food critic and writer, experienced a rapidly expanding waistline due to his job. He finally hit on some key principles for eating well and maximizing the pleasure we get from our food while maintaining a sustainable weight. He discovered that the more you maximize FPC, the more you are satiated with less. In other words, bland, overly processed foods full of sugars, salts, and fats tend not to satisfy us very well. This leads us to keep eating in pursuit of an unattainable taste. However, foods that are packed with flavor make us feel full and satisfied more quickly. We eat less and we enjoy it more because our taste buds are firing at top speed. Maximizing FPC is like taking the flavor of the meal and then squaring it. Some things that maximize FPC include grilling, creating a deep brown crust on meats, reducing & concentrating sauces, caramelizing, and using high-FPC ingredients such as Parmesan cheese. 2) Salt & pepper a roast, then deeply brown on all sides in oil. Cook on a wire rack in a very low oven (like 200 F or less) for several hours until the middle is rare/medium rare. You'll have a tender roast that's bursting with flavor. Maximing FPC isn't necessarily difficult, expensive, or time-consuming. You just need to know what to do. For that, Kaminsky's book is a good primer. Here's the recipe for Dijon chicken, adapted from a French recipe using rabbit. Salt & pepper the chicken. Brown in a cast iron skillet until deep golden on all sides. Set aside. Sautee the onions and some butter in the same pan until golden. Add the chicken, salt & pepper, mustard, white wine, and a few cups of broth. Stir to scape up browned bits. Cover and cook for 30-45 minutes until the chicken is very tender. Remove the chicken and boil the cooking liquid on high until it makes a thick, concentrated sauce. While you're cooking the chicken, make the mustard cream sauce by putting all 3 ingredients into a saucepan and boiling until reduced by about half. Salt & pepper to taste. Serve the chicken with the 2 accompanying sauces over potatoes or rice. And it makes perfect sense. My dad grew up on a diet full of bland foods and high carbs (think stereotypical large Mormon family and you get the picture). His entire family has struggled with weight problems (he lost 70 pounds after being diagnosed with Type 2 diabetes. My mom loves flavorful foods and always has, and she hasn't any significant weight problems. Sounds amazing!!!! I can't wait to try the chicken recipe. Would love to hear about how to increase the flavor per calorie of more foods! Trying the green beans this week. You're making my mouth water. Yum. In doctoral seminar a few months ago one of the nutrition students started going off about the nasty things that show up due to the Maillard reaction. As you can imagine, the entire food-loving section of the audience looked at the "grilled chicken" bad vs "overly-boiled chicken" good slide and just shook our head in sadness. Some things in life are worth their downsides, flavor is one of them.